The University of Toledo and Women’s Soccer Head Coach Brad Evans have agreed to a six-year extension to his contract, Athletic Director Mike O’Brien announced today. 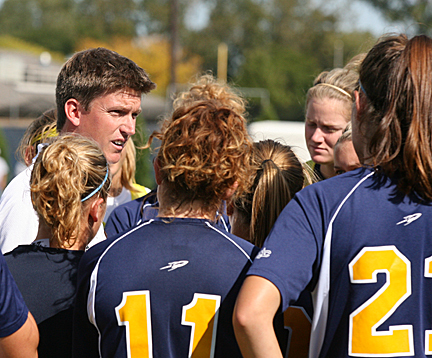 Head Soccer Coach Brad Evans talked to his team during a timeout. Evans’ current contract was due to expire at the end of 2009 season; Evans’ new contract with UT runs through the 2014 soccer campaign. “My wife, Kristen, and I are thrilled with the generosity of this extension,” said Evans, who owns a 78-65-16 overall win-loss mark in eight seasons at UT. “For Mike [O’Brien] and Dr. [Lloyd] Jacobs to show this kind of faith in me is extremely gratifying and rewarding. In 2008, the Rockets appeared in their third consecutive NCAA Tournament and finished the season with a 16-5-1 overall record and 8-2-1 in the MAC. Toledo earned the automatic berth to the NCAA Tournament after winning the MAC Tournament for a third consecutive year, becoming only the second league school to accomplish such a feat. Evans’ team set school records in wins, shutouts (12) and goals-against average (0.94) en route to its first regular-season league title. On an individual basis, UT saw five players earn All-MAC accolades, including conference player of the year, forward Molly Cornwell, for the second-consecutive season, as well as freshman of the year, goalkeeper Vicki Traven. In the classroom, Toledo was recognized for having a top 10 team grade point average in the nation for the third straight year. The Rockets posted a 3.46 overall GPA to rank 10th among Division I programs, led by senior Laura Mecklenborg, who earned a spot on the third team of the 2008 ESPN The Magazine Academic All-District IV Women’s Soccer squad. In 2009, Evans and the Rockets will return 18 letter winners, including nine starters. Toledo will open its fall season at DePaul Friday, Aug. 28. This entry was posted on Friday, February 20th, 2009 at 4:39 pm and is filed under News, UToday .